Board Certified as a Family Nurse Practitioner by the American Academy of Nurse Practitioners. 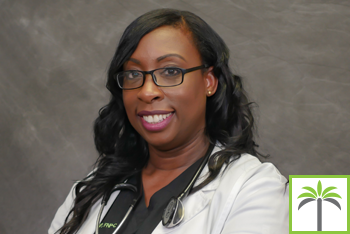 Shari Johnson attended and graduated from Florida International University, Miami, with her Bachelor of Science in Nursing. Shari also graduated with honors from Chamberlain University, Illinois with her Masters in Nursing, and is a member of the Sigma Theta Tau International and American Nurses Association. Shari has over 15 years of nursing experience with an extensive background in Telemetry, ICU/CCU Critical Care, Pre/Post operative care and Interventional radiology. She is also certified in PICC line placement. Shari has excellent experience in direct patient care, receiving numerous awards for providing excellent quality care to her patients including C.A.R.E Award and participating as a volunteer for hurricane relief. Shari is devoted to ensuring the longevity of her patient’s health, developing long-lasting relationships, and delivering the best treatment available.